This Thursday evening Dutch gothic metal band Delain was throwing a party in honour of the release of their second album April Rain. Mastermind of Delain is Martijn Westerholt who needed to start a new band to take a shot at the glory he missed out on. In 2001 he was diagnosed with Pfeiffer's disease just before his band Within Temptation was at the point of a break through. 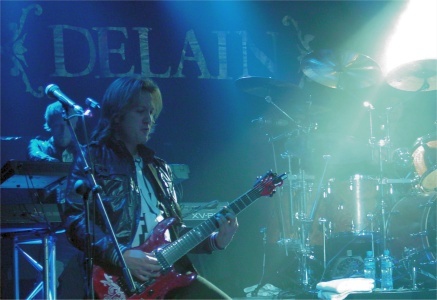 He had to leave the band and in 2006 he returned with his project Delain. The debut album Lucidity featured many well known names like Marco Hietala (Nightwish), Sharon den Adel (Within Temptation), Ad Sluijter (Epica) and Liv Kristine (Leaves Eyes). The biggest star on that album was Charlotte Wessels, an unknown 19-year old singer that lived down the street from Martijn. 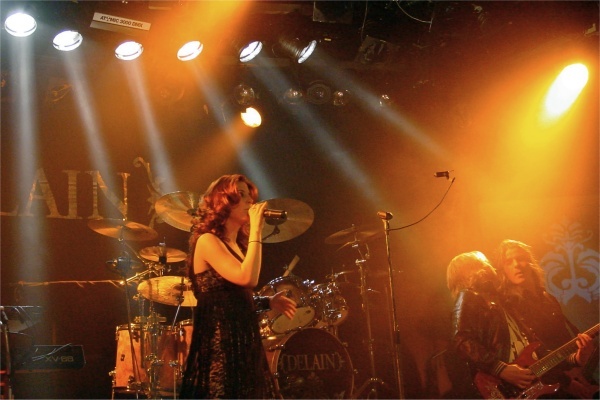 Delain was intended as a one time project but Martijn searched and found band members that were given the difficult task to compete with the famous names on the album. The first time I saw them was just after the release of their debut album and they already impressed me. Though not as technically skilled or experienced they showed potential and above all a very positive attitude towards their music and audience. Delain is a band that is trying to become more than a support act. The concert was in the small hall at the Melkweg but the place was packed, my estimation of the number of people who attended the concert would be about six hundred. When the curtains opened two big screens on each side of the stage showed that Delain was being professional about their music career. The guitar and the microphone had a small camera that displayed live action on the screens. I was surprised they did not start with the title track and Invidia was not a song that really pleased me. Control The Storm and Stay Forever, both also from the new album, satisfied me a lot more. This could also be because at that time I had inserted my earplugs so that the volume level would be decreased to an acceptable level. The new songs feature more vocals by Charlotte and less male vocals and grunts, later it became clear that this is the case for the majority of the new songs. The keyboard intro to Sleepwalkers Dream was welcomed with a big roar. The audience showed that they knew the lyrics to this song from Lucidity. Next was title track and next single April Rain. The screens showed the video clip that was shot in Serbia. Great performance and a confirmation that Delain has grown as a band. I'll Reach You and On The Other Side also impressed me and I was amazed by the amount of new songs Delain was playing. Instead playing well known songs from their debut album they almost completely played their whole new album. The guitar solos are not a hot issue in the sound of Delain, just like for Epica for which they supported in the past. I shivered while watching a guitar solo that looked more like an easy practice tune and a solo a bit more difficult was certainly not flawless. Guitar player Ronald Landa is more convincing during the metal riffs. Sever started with a slow drum intro but this opening song from Lucidity created some headbanging action. Lost was followed by Delain's very first single Frozen. Delain asked the audience to go crazy on their mark during Go Away. And at their mark the audience replied with headbanging and all hands up in the air. For me, and probably a lot more, the best Delain song is The Gathering. This song is easily accessible and always causes jumping and singing among the fans. The first time I saw them they had to play this song twice due to lack of material but two years later this was not necessary. The first part of the show ended with April Rain's closing song Nothing Left. Of course Delain returned after shouting "We Want More". New song Virtue and Price was followed by the closing song of Lucidity, Pristine. Delain has become more professional and the new songs impressed me. Delain still has that positive attitude and a very pleasant vibe. Their solid fanbase and fame resulted in a nice Spinal Tap moment. Guitar player Ronald Land could not find his way to the backstage area and seemed a bit scared when a Melkweg employee told him he had to walk through the area between the wardrobe and the CD stand. Their fame has not risen to that level, ha can walk amongst Delain fans without his clothes being ripped off, but Delain sure made the next step. I do not think Martijn will achieve the same level as his former band Within Temptation but the new album April Rain is certainly one to be proud of. Hoping to hear from this band a lot more.